One thing that prompted me was a very nice comment I got earlier this month from the great, great, great granddaughter of Soloman Parrish, the man who was the original owner of the property on which Parrish Rocks sit. Because of my various posts on going to Parrish Rocks she was able to find out where it was and try to visit it. Something like that really makes writing this blog feel rewarding. 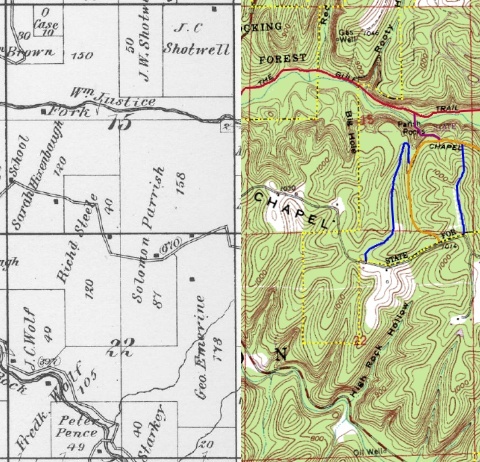 Here’s a side-by-side map showing the same area in the 1870s (with the Soloman Parrish farm marked on it) and on today’s USGS topo map (with trails added). When I visited I also tried something a little bit different. Instead of bringing my good camera I brought a video camera instead. So I have some video you can watch. Approaching Parrish Rocks from the top is always interesting. 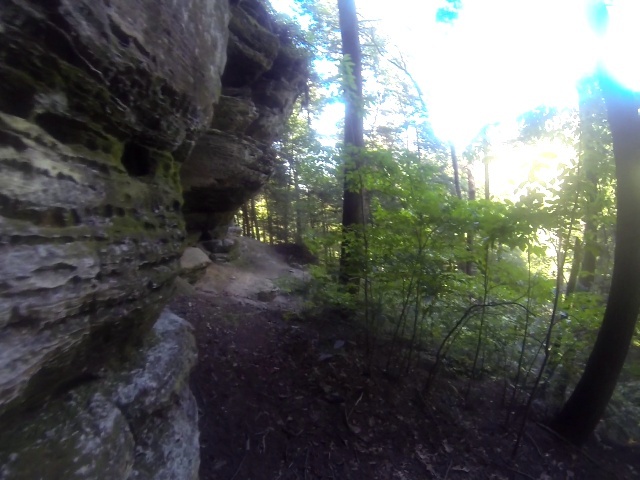 The cliffs above the gorge at Hocking Hills only has a few points where you can descend, and for Parrish Rocks you just have to know where that is. The route hugs the cliff face. In this case, the route that’s the most fun takes you between some slump rocks. In the video, you can see that I managed to miss the opening (it had been a while since I’d last approached it from this direction) and then had to backtrack to use it. Once you get down to the mid-level it’s fairly easy to finish descending along soil and leaf-litter. Here I follow the creek up to the (mostly dry this time of year) waterfall and go into the (rather deep) recess cave underneath Parrish Rocks. From there I headed up Queer Creek towards Cedar Falls, took a detour around the top of Rose Lake, and then crossed the metal bridge on the way back to my car at Cedar Falls. Here I am on the main trail in the gorge that heads to Cedar Trails. As you can see, it is very broad and gets a lot of use. You can maybe see Queer Creek on the left there. I’ve shown pictures of that bridge before. 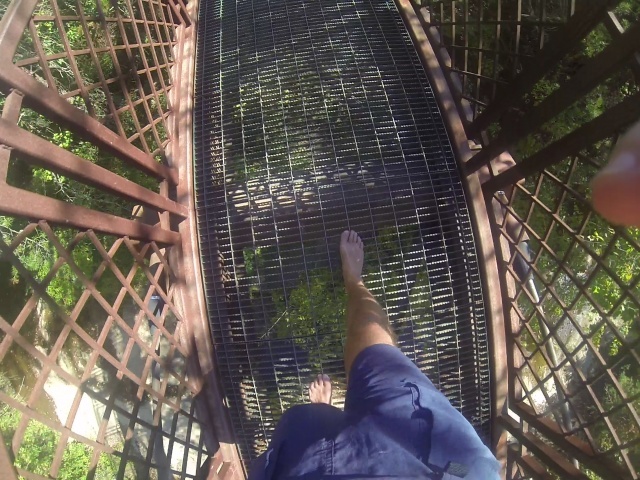 It has really great traction, but assumes you’ll be wearing shoes, because the metal grate has little spikes sticking up. But it’s not too bad for a seasoned barefooter. Notice that the left/right slats have the points, but the front/back ones don’t. So as long as you put you feet on those front/back ones your feet can handle it just fine.